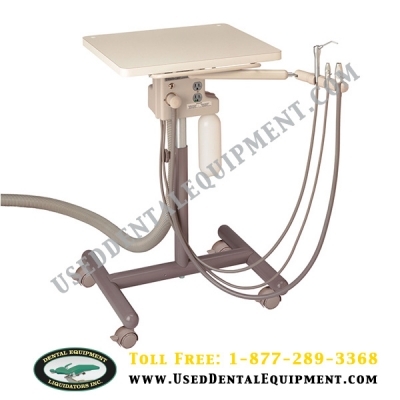 Stain-resistant materials and rugged hardware, such as a solid steel base to maximize stability, you can be sure your Cascade Cart will easily withstand the daily rigors of your practice for years to come. Cart includes a rotating arm that delivers assistant's instrumentation precisely where you need it. The utilities can be mounted to the wall or in your cabinetry, allowing you more room to move around. And with four durable, smooth-rolling casters, you can easily position your cart during procedures and quickly move it out of the way when it's not in use. Powder Coated painted frame; Adjustable Height 31"-43"